In October of 1860, 10,000 men marched on Chicago in military formation. Dressed in uniform and marching with precision, the young men carried 10,000 six-foot tall flaming torches and sported banners featuring a strange insignia. Their presence drew a crowd of an additional 100,000 people to behold the sight. "Men poured from the depots to the hotels in one unceasing tide. All of the hotels and lodging houses were taxed to their utmost to feed this vast array. Add to this the constant din of drums, fifes and bands, and it seemed that the city was invaded. We have witnessed no such excitement and enthusiasm before and at the hour of our going to press there is already gathered the largest crowd that ever visited the city." What did this political army want? Referred to as the Wide Awakes, this paramilitary political group supported the Republican party and allegedly had 400,000 members nation wide, according to an 1860 issue of the New York Herald. What did they want? Well, they fervently wanted Republican candidates elected, especially Presidential candidate Abraham Lincoln. It's also safe to say that most probably wanted to rough up any Democrats they came across. the Wide Awakes symbolize the jarringly different world of 19-century politics that our ancestors participated in. These clubs were organized locally all over the country, and their stated purpose at the time was to act as "political police" to ensure order during speeches and elections, though in practice they often did the opposite. They also used their organization to perform elaborate marching routines and celebrations at political rallies. 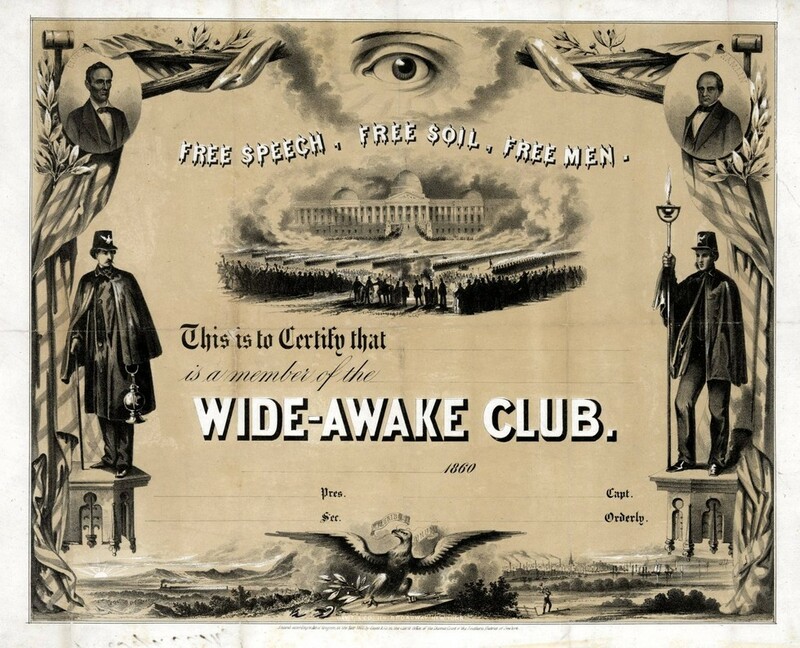 A Wide Awake membership card from 1860. Note the symbol at the top and examples of the uniform on the left and right side. Democrats at the time organized adversarial groups, some of which were cleverly called the "Chloroformers" in response to the Wide Awakes. Opposing groups often clashed at debates and rallies - massive brawls, occasionally involving hundreds of participants would break out, and shots were commonly fired. How involved were you ancestors? To be sure, intense violence wasn't all that common, but the Wide Awakes symbolize the jarringly different world of 19-century politics that our ancestors participated in. You might not think that your family from the 1800's ate, breathed and slept politics, but the truth is they probably paid far more attention to elections, campaigns, speeches and rallies than you realize. As opposed to the deferential politics of the 1700's - where enlightened elites were trusted to make responsible decisions for the population - the 1800's was a century of mass participation: Everyone had a stake, and they cared greatly. So greatly, that most political organizations were run (and behaved) just like the military. Political speeches and debates were famously well attended. For example, tens of thousands attended the Lincoln-Douglas debates in Illinois - impressive considering there were no microphones whatsoever. But along with the massive crowds and public participation came militancy and violence. "Cooping" was a shocking practice that was all too common in the world of our ancestors. A way of committing election fraud, political gangs like the Wide Awakes (though there isn't much evidence of the Wide Awakes specifically cooping) would kidnap people from the streets and force them to vote for candidates they supported. Victims would be plied with alcohol to enforce compliance and beaten or killed if they resisted. And usually, voting once wasn't enough - the gangs often forced their victims to vote multiple times by disguising their appearance with different outfits, wigs or fake mustaches. Patronage: One major difference in the politics of our ancestors was that the livelihood of many depended on victory in an election. When a candidate won office, he would reward his constituents and organizers with lucrative government jobs. People at every level of society hoped for these appointments, especially during periods of economic hardship. Militia fever: Historians have noted that a bout of "militia fever" hit the United States around the middle of the century. Americans everywhere obsessed over military-style uniforms, parades and social events. The young men who joined the Wide Awakes were likely thrilled to emulate this behavior. Both actual and political militias served important social functions as well - as boys clubs, but also to impress women. Finally, the technology of the time and the fact that many organizers came from military backgrounds made this style of mobilization a logical choice. Entertainment: In case you haven't noticed, there wasn't a lot of television, radio or film available in the 1800's. Political campaigns were often the most entertaining thing going on. Think about all of the time you spend today talking about entertainment - movies, television, sports, etc. Take everyone's collective passion and put it towards one thing - politics - and you can begin to imagine the attention political events captured. The issues: Historians consistently note that ideology inspires a special level of passion and violence in conflicts, and boy were 19th century Americans ideological. The 19th century was perhaps the most formative in American history, as the country dealt with political issues central to our identity as a nation and exercised their new-found political agency. Think about it - you might not come to blows over the Affordable Care Act, but what if you met someone who argued that humans should have the right to own other humans because of their race? When we're researching our ancestors, it's easy to fall into a state of mind that modernizes their experiences. When we are able to fully realize how shockingly different the world of our ancestors was from ours, it opens up our eyes to what it truly means to be a family historian. Read more: 200th anniversary of the Year Without a Summer: How did your ancestors survive endless winter?